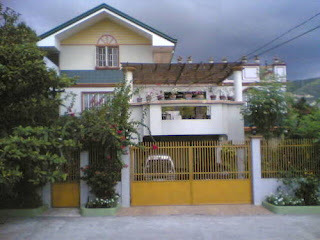 Inset Photo: One of the houses in Forest Hills that fetches for 12 million pesos. "Doug and I just got the 800-square meter lot at the Forest Hills. And you know what’s so great about this house, this lot that we’ve got, it’s on top of a cliff overlooking Makati and Ortigas," she says, still brimming with excitement. "I’m so proud of it kasi, alam mo, lahat ng pera dun, pinaghirapan namin ni Doug." "The man I love," "my husband-to-be," "the one"—Cheska can talk about Doug endlessly. We've never seen a lady so happy, so in love, and so excited about her future. Best wishes!